Reactions (5) and (6) are considered the main equilibrium reactions for the basic method of carbon transfer into the steel surface. The assumption is that the carburising is taking place as a direct result of the CO content in the atmosphere. However, the Oxygen probe has no way of measuring the %CO. A fixed value has to be introduced into the Carbon potential controller in the form of a Process Factor or CO factor (see below). Furthermore, equilibrium conditions do not exist in a furnace until several hours have passed – the actual %CO will be considerably lower than expected. It has been shown that reaction (5) is 10-100 times faster than reactions (4) and (6), and it is therefore this that is rate determining. In most systems, the addition of a hydrocarbon gas such as methane is used for the control of carbon potential. If all the methane was “cracked” using reactions (2) and (3), the atmosphere would remain in equilibrium and predicting carbon potential would be straight-forward. Unfortunately, these reactions occur at very slow rates and only near catalytic surfaces. They are never close to equilibrium. In an atmosphere with a significant level of free methane, some carburising will be taking place according to reaction (4), but increasing levels unreacted methane will result in the dilution of the %CO. Without measuring and including the effects of free methane in the carbon calculation, the real potential of the atmosphere is not known. Since K6 is temperature dependent only, it can be seen that the carbon activity can be calculated from the CO and CO2 and since the CO is relatively constant, the CO2 alone can be used. We have already seen that the Oxygen probe measures the small amount of oxygen in equilibrium with the CO and CO2 which is according to the following reaction. Hence the oxygen probe can be used to determine the carbon activity of the atmosphere, and the carbon potential can be shown to be a function of carbon activity (ac), temperature and steel composition (q). The dependence of carbon potential on the steel composition, can be explained by the fact that in the presence of alloying elements the effective carbon potential of the atmosphere is increased be elements which form more stable carbides than iron, i.e. Cr, Mo, whereas less strong formers, i.e. Ni, Si, decrease the effective carbon potential. From the above equation it can be calculated that for a plain carbon steel (q=1) processed in a methane generated Endothermic gas (CO = 20) the Process Factor will be 147. However, practical experience has shown that the process factor, under these conditions can vary between 150 and 250, dependent upon unique furnace conditions. An important aspect when determining the process factor is the Cycle time, since it has been shown that the steel surface does not reach equilibrium with the gas atmosphere until 20 hours have elapsed. Therefore, if the carbon potential is controlled at 0.8%, the steel surface will have only reached 0.7% after 4 hours. 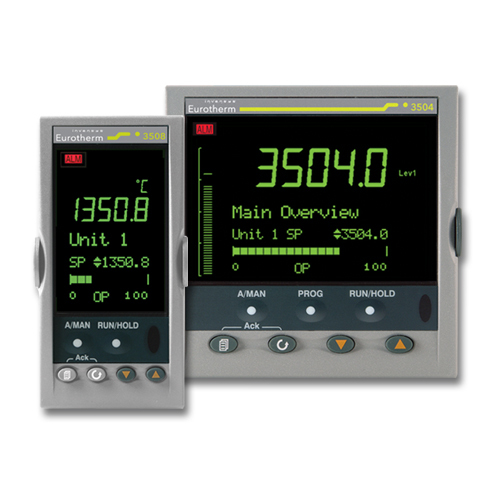 For non-equilibrium atmospheres or when the CO may be constant during a cycle, it is possible to input a CO value from an infra red analyzer via the auxiliary input. For absolute carbon control accuracy the Process Factor can be continuously updated based on the carbon potential calculated from a 3 gas (CO, CO2 , CH4 ) ULTRACARB 1000 INFRA RED SYSTEM. This system gives the absolute accuracy of 3 gas carbon calculation with the speed of response of oxygen probe control.